Fort Scott in Fredericksburg is a living piece of Texas military history. Guests can stroll the grounds and see the remaining buildings and even participate or view a re-enacting event meant to bring history alive. The mission of the fort is to promote, preserve, and protect the heritage and historical significance of the fort, which is the “guardian” of the Texas frontier. It was the very first United States military post in the western portion of Texas and is listed on the national registry of historic places. 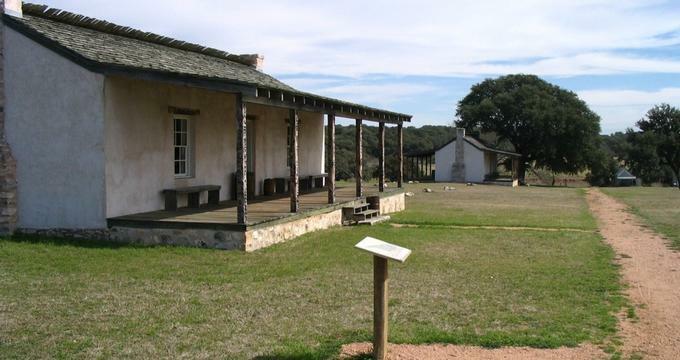 It was active from December 1848 to April 1953 and was created after the Mexican War to protect settlers as well as travelers through the western part of Texas, originally called Fort Houston. It is located in Fredericksburg, Texas which is roughly 70 miles from both Austin and San Antonio. It was also the site of the historical Fort Martin Scott Treaty, which helped ease tensions between settlers and Native Americans in 1850. Admission to the fort is free of charge for the general public. Parking is available in the grassy area to the left of the site, also offered free of charge. Donations are always welcome, however, and go to help maintaining the site. The fort is closed on Tuesdays and Wednesdays. Fort Scott - Tour what remains of the grounds of the original Fort Scott. The Fort originally consisted of twenty one buildings, although many of them have been lost to decay and disuse. However, some of those original buildings have been restored and are available for viewing while visiting the fort. Braeutigam Farm - The farm was built after Fort Scott was abandoned in 1866 on the 640 acre original grounds. Many of the original fort buildings were repurposed for use at the farm (for instance, the stone guardhouse was used as part of the Braeutigam home). The farm was the home of many events during the Braeutigam’s time there - including the first four of the Gillespie County’s fairs (the longest and oldest fair in Texas) and a popular local saloon called Braeutigam’s Garden. Interpretive Center - Located in the Barracks building (which has recently been remodeled) is the Interpretive Center for Fort Scott. Open Fridays, Saturdays, Sundays, and Mondays from 10 am to 5 pm (the same times and days that the other fort buildings are open to the general public), the center helps guests learn about the history of the fort, offers exhibits with documents and other artifacts, and can guide guests through the fort by offering guided tours. The days that the interpretive center is not open, guests are still welcome to do their own self guided tours of the fort, although the buildings located on the grounds will not be open. Visiting guidelines to be aware of : As the fort is a national historic landmark, it is expected that all visitors respect the natural, historical, and cultural resources located on the grounds. Visitors must remain on the marked trails, must not disturb any of the buildings or remove any objects, and pick up any and all trash. Pets are welcome, but only those on a leash. Visitors must pick up and discard any pet waste. The fort offers many historically based events throughout the year, meant to engage and entertain guests with living history. The fort is always interested in encouraging history re-enactors to participate as well. Fort Scott Days - Offered in April, this two day festival features living history with military, Native American, civilian, and Frontier Lawmen reenactors that showcase the active history of the fort and the people who surrounded and inhabited it. This festival also features events catered for children, and one of the days is specifically for school groups. Frontier Days - Another visitor favorite is Frontier Days. This special events features musicians, living history reenactors, period specific foods and displays as well as craft activities for adults and children alike. There are also live action military drills. Some of the special events may require a fee and/or reservation in advance, so it is strongly encouraged that visitors check the website or call ahead of time. The fort features an old fashioned general store called Sutler’s Store, that features a variety of original and fort branded merchandise for guests to purchase to both support the grounds and also remember the visit. Check out the apparel (hats, t-shirts, etc) as well as patches or just make a donation.